The emergence of print in late fifteenth-century Italy gave a crucial new importance to the editors of texts, who could strongly influence the interpretation and status of texts by determining the form and context in which they would be read. Brian Richardson examines the Renaissance production, circulation and reception of texts by earlier writers including Dante, Petrarch, Boccaccio and Ariosto, as well as popular contemporary works of entertainment. 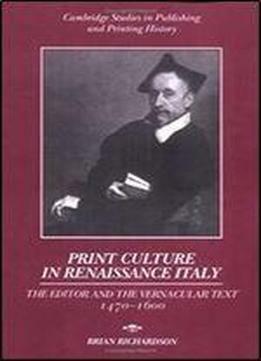 In so doing he sheds light on the impact of the new printing and editing methods on Renaissance culture.